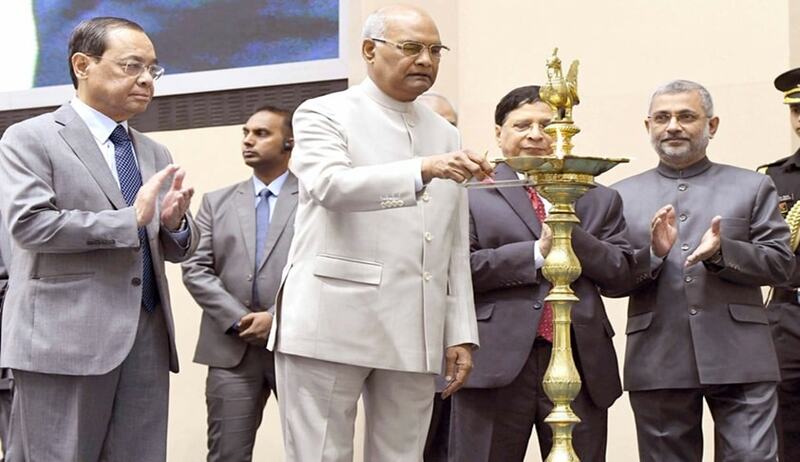 While inaugurating a national conference on “Technology, Training, and Infrastructure: Key to Speedy Justice” organized by the Supreme Court Advocates-on-Record Association (SCAORA) at New Delhi on Saturday, President of India Ram Nath Kovind spoke on the backlog of cases in the judiciary. Being a practicing lawyer of the Supreme Court before becoming the President, he said, to be in the function of SCAORA is like a homecoming for him. He cited several reasons for pendency of cases including the infrastructure gaps and frequent adjournments took by the lawyers in the courts. “There are infrastructure gaps and considerable vacancies, particularly in subordinate courts. There is a culture of seeking adjournments as a norm rather than an exception. New thinking is gradually taking place on frequent adjournments. I have been told that the judiciary is making sincere efforts to curb this practice. I am confident that the members of the entire legal fraternity will resolve not to seek adjournments except in absolutely unavoidable circumstances,” the President said while highlighting the steps taken by the Narendra Modi government in reducing the pendency of cases which included the slashing of Litigation by government and merger of tribunals from 36 to 18 in this regard. President Kovind also highlighted the importance of modern technology in Justice Delivery System. “A start was made in 2016 with the opening of India’s first e-court in the High Court of Hyderabad. Since then, the idea of e-courts has spread elsewhere. The setting up of such e-courts requires centralised electronic filing, digitalisation of documents, adoption of a document management system, creation of e-filing and e-payment gateways, as well as the use of hardware and software in the disposal of cases. I am happy that this concept is gaining ground, and I appreciate the judiciary for taking a lead here. Innovations such as evening courts and family courts, and the concerted effort made in delivery of speedy, fast-track judgments in cases of sexual crimes against women, are also noteworthy. “On the pathway of the government’s Digital India initiative, the Legal Information Management and Briefing System (or LIMBS) has been introduced as an online mechanism to monitor and streamline court cases, and to reduce the government’s own litigation. LIMBS attempts to bring all stakeholders – from Ministries to advocates to claimants and others – on the same platform. This will check delays and financial costs. So far 2.6 lakh court cases have been placed on this platform. The digitalization of the Income Tax Appellate Tribunal and the online system for notary certificates too are worthy of appreciating”. He added. President said the subject of legal education is linked closely to technology adoption and efficient justice delivery. Appropriate use of infrastructure calls for training of all those who are part of the system– be they judges, lawyers or administrators. Strides have been made in improving training for judicial officers. Judicial academies have been set up in almost all states, complemented by the National Judicial Academy in Bhopal. President said that the traditional law faculties in public universities provide the backbone of the legal fraternity in India. Their rejuvenation, including access to greater funding from private and innovative sources, should be a common endeavour. When it comes to private law schools of a certain stature, the Bar Council of India could consider providing greater autonomy – perhaps recognising them in the manner of “institutes of eminence”.